AHRC ICT Methods Network: Supporting the Digital Arts and Humanities : What is Podcasting? When this address is pasted into the ‘subscribe to podcast’ window in a package like iTunes, all the available audio material that is featured on the Methods Network website will become available for users to listen to (free of charge) and download onto their portable media players. Podcasting is a method by which subscribers can automatically retrieve audio files (using their chosen software package) from one or more specified websites without having to actively go to each website in turn to check for new uploaded material. Having acquired the audio download, the file can then either be listened to on a PC or can be synchronized with a portable media player. The usual implementation of this technology is in the context of providing a way for users to asynchronously acquire items that will form part of an audio series and is popular with Internet radio stations and other organizations that regularly produce new content. It can, however, also function as an alternative delivery method for a static collections of audio files on a website. The best known software package that deals with podcast functionality is iTunes, developed by Apple Computer Inc., who are also responsible for the iPod media player, the name of which was appropriated for use as the standard appellation for the non-proprietorial activity that became known as podcasting. 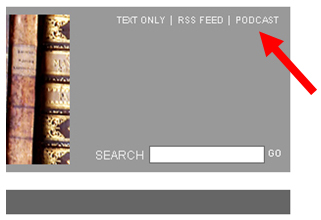 To subscribe to a podcast, the user must copy the URL of the relevant podcast feed into the appropriate location of whichever system they have chosen to use. It should be apparent that podcasting and the use of RSS (Really Simple Syndication, see theRSS page) are closely related processes. RSS is a way of disseminating textual information that contains links to other web pages whilst podcasting is a way of disseminating audio information. Used in combination, RSS postings can in fact contain enclosures that will point the user at podcast files and this is another method by which suppliers of podcast material can alert users to the existence of particular resources. A number of audio files are permanently available from the Methods Network website and these can be listened to without having to download podcasting or RSS software. If you do not wish to take advantage of the podcast functionality but would like to listen to the audio material anyway, please go to the audio files index.